This has been the play I have been going on about on Twitter for the past 3 months! 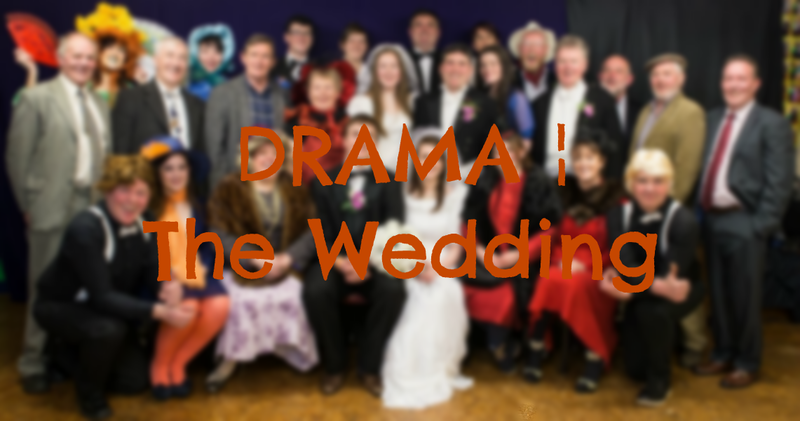 My character Mandy, gatecrashes a wedding in a wedding dress convinced she is going to marry the groom, just an average day for me! After realising her chances with the groom are very low she decided to go after the bride's ex-boyfriend, Harold. She is also not the most intelligent person in the world as she thinks someone is a bachelor because he has a bachelor's degree. Since the play was set in the 80's, I went for like a perm look but my hair wasn't really co-operating with me so it ended up being very curly. I tried to continue with the 80's vibe with the makeup with bright blue eyeshadow and a vibrant pink lip. The wedding dress, there is no other word to describe it other than old fashioned. It looked horrible but that was what I needed. It was comfortable enough to wear. You could really call Mandy a diva, with 3 meltdowns, arrives to a wedding in a wedding dress, threatens someone and cases so much drama, you can see why I would call her that. Along with that, I had to sing We Go Together from Grease. I didn't really mind when I was asked as I am up for anything and I had forgotten that it was going to be in front of 500 people. I actually enjoyed singing but the song didn't suit my voice fully. I love being on stage, I always feel the most alive when I'm someone else on stage or just being a drama queen in general! I do get nervous, I think everyone does a little, nerves are good as they keep you alert. As the years have gone by I have loved being on stage more and more. It's like a drug to me, it's kinda weird to compare it to drugs but there is no other comparison. I loved the group that I was with, we are all locals. At the start I only knew a few people as it was my first year to do it but I got to meet some wonderful people. I also got to experience what it is like to work with an adult cast as I normally did a play with people my age. I really enjoyed this experience and I am sad that it is over, I'm going to be honest, I don't want to sugar coat it. I miss it terribly, I miss the excitement and happiness I got from it, the people I worked with and the funny moments we had as a group. Hopefully I'll get the opportunity next year to do it again. I miss it already and it was only a week ago! What do you think of Mandy?